Little I can say apart from the fact that the service was exemplary. The goods exactly as advertised. Indeed the whole transaction was in keeping with my previous dealings with Cable Chick. Thank you. Universal Suction Car Mount for Smartphones + FREE SHIPPING! Finally, the perfect Windshield Mount for your phone! I might be showing my age, but I still remember the days when it was almost cool to have a GPS mounted on your windscreen... ahh the tech memories. Well today with Navigation systems available in almost all new car models, we are still in need of mounting our phones while driving. Whether it's just to have your phone stored in sight while driving for taking calls over hands-free, or supplementing your nav sustem with Google Maps (let's face it, Google still does navigation better than any in-car system), or even if you're a full-time Uber driver - the needs for a good, sturdy in-car phone mount are many and varied! We've seen them before, and that's why we decided to put this phone mount through our testing process to ensure it works wonders. You see, many suction-cup style phone mounts just lose their suction too quickly, or come loose over bumps. However from our testing, this mount stayed true and held it's suction after hunders or klms and days of driving - on all types of road surfaces. Just be sure to give your windscreen glass a good clean first for maximum adhesion. The Suction Clamp & Release: A good clamp & release design is essential to maximising suction, and preventing the seal from letting go. Grip on the phone: There's no point having a strong suction mount if the phone keeps slipping out. So you'll be please to learn that the form padded grips hold phones exceptionally well, and there's even fold-out feet if you're worried about a heavier phone slipping downwards! Scratch Protection: As great as a car mount is, you don't want to add scratches to your expensive gadget by mounting it in you car. 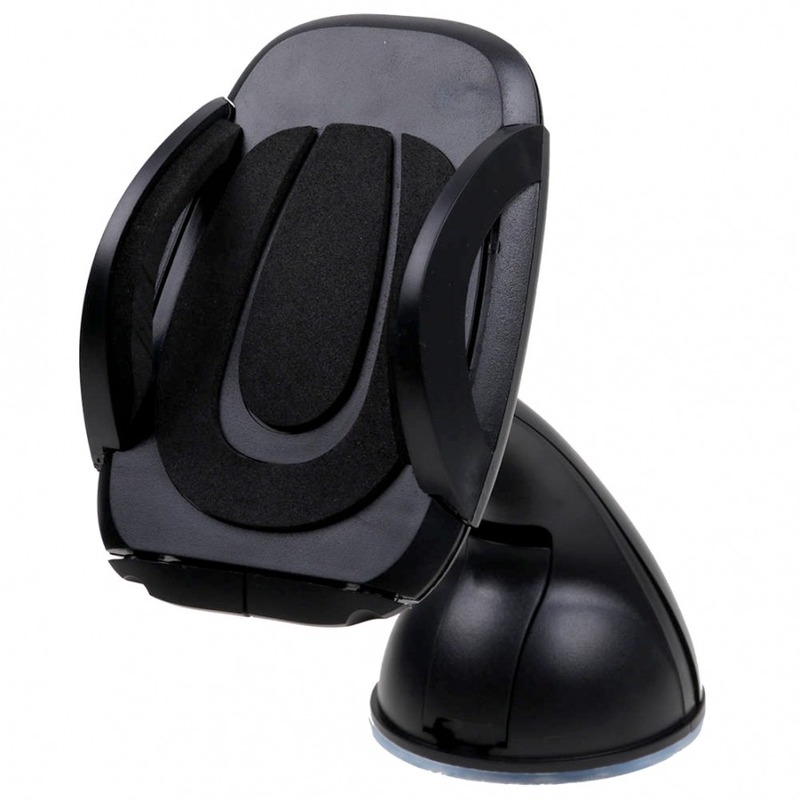 The padded form grips on this mount do an exception job of holding your phone, without any chance of scratching your beautiful device. Versatility: Phone comes in all shapes and sizes, as do the cars we drive. This phone mount exceeds expectations by offing an adjustable ball-joint socket to lock in the angle you want, and it supports phones from 43mm to a massive 100mm wide. If that weren't enough, they've added a quick-release button which releases your phone once you've finished your trip. That's incredible!! So yes, I'm a little pumped about the car mount finally answering my prayers! It’s easy to attach and detach the universal suction mount to any window, and it will stay stuck on even the longest trips, keeping your phone safely out of harm’s reach. Mounts securely on any glass, tile or other suitable surface. eg kitchen tiles to view whilst cooking. Answer: "Both mounting trays have a cut-out for the camera, but you may have a limited field of view depending on how you attach the mount to the windscreen, as the suction cup is directly behind the tray in a typical installation. It could work if you played around with the rotation and orientation of the suction cup and ball swivel. Horizontal mounting could be achieved if you tightened up the assembly once in position. Please take care to follow local laws regarding the placement of screens in the driver's field of view to avoid fines."